This site is located off Portway opposite St Marks Church and consists of 4 two bedroom bungalows for affordable rent. Lullington offers age restricted bungalows, level access, close to local amenities. 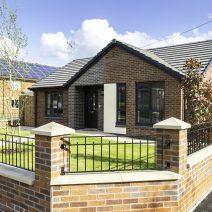 The development is situated in Woodhouse Park close to the Wythenshawe Lifestyle Centre and offering superb transport links to the nearby Civic Centre and beyond. All properties benefit from individual front and rear gardens with driveways, blending traditional construction with a contemporary design, meeting secure by design standards and incorporating modern energy efficient features including Photo Voltaic roof panels, high quality bathroom and kitchen fittings along with A-Rated condensing combi boilers to provide warm and comfortable secure and efficient homes for our customers.